Have you ever stopped to take some time to think about how far you’ve come? About how far you’ve grown? About how much positive changed has occurred in your life? I have to be honest – I haven’t really. There are some pivotal life moments where I’ve reflected on all of that mumbo-jumbo…maybe graduations, big birthdays, or the New Year. And sure enough, with graduation in six days, I find myself looking back in preparation of moving forward. 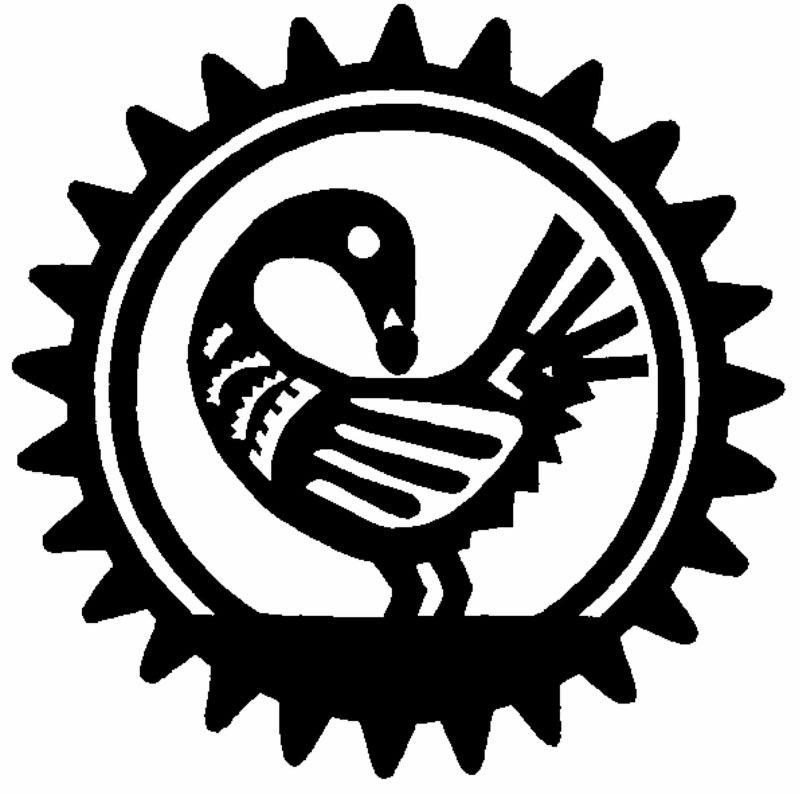 It’s the Sankofa bird. Moving forward, but using the past as a guide. I know I’ve blogged about this concept before, but I don’t mind repeating it, because I think it’s important. In looking ahead (post-graduation, new job, new city, new people), I’ve been doing a lot of reflecting of the past. On my first day in Buffalo I felt _____. Now, I feel _____. There have been so many ups and downs. I’ve complained that “this isn’t my place” or that it’s hard to find friends here. But you know what, Buffalo has really given me a run for my money. Because sure enough, as I’m preparing to leave, all these people who I really love and care about are popping up around me as little reminders, saying, “Hey! Don’t leave! Don’t forget about us! We love you!” And I love them, too. I’m really going to miss this place. I’m going to miss the people I met. But I also understand that true friendships transcend geography. Still, it’ll be different. But thinking about all this made me wonder, how many of us take the time to think about how far we’ve come? We are constantly living in the day-to-day stresses and struggles, or even the day-to-day joys and happy moments…it’s not necessarily a bad thing, living in the present, right? But at the same time, it’s hard to see any growth in ourselves if we forget about the past, and that can make us feel stagnant and stuck. So today, I want to take a minute or two for all of us to reflect on how far we’ve grown. There’s always darkness before the dawn. After every storm there is a rainbow. April showers bring May flowers. The message is similar – there will always be some not-so-great times, but those times are required to move forward, to experience the dawn, the rainbow, and the flowers. What are three things about myself that I love? Who is always there for me, no matter what? Human connection is the #1 factor in human happiness. Who are your people? What is something that I am really proud of? It can be big, it can be small. I’m proud I folded the laundry earlier today. I’m also proud that I have finally come to find a second home in Buffalo with some really amazing people around me. What is something that I have overcome? Let’s not forget our triumphs. It’s easier to forgot the hard times, but with that, also comes forgetting about our accomplishments. What are my May flowers? Looking around you and looking within, what are the things that have blossomed and bloomed for you? And on this sunny May day, even though April showers, I am wishing you all the very best May flowers. Hello y’all and happy Easter (if you celebrate)! Also, I apologize for the southern y’all, but I just can’t shake it since being back from Selma. Anyway, happy Easter! I’m not sure why, but lately, I have been reflecting a whole lot on my past year. And actually, thinking about it, I know exactly why. Last year, I wrote a blog post on Easter that was basically talking about how the holidays were so different as a twentysomething – there was no more Easter Bunny, no more colored eggs, and worst of all, no family love around. I love school and my job is great, but last year, being away from everyone I loved was hitting me hard. This year, things are looking a little different. I facetimed with my parents this morning, I called my grandmother, I had an amazing brunch with a really good group of friends, and then I went to see my sister to catch up, see a movie, and have a nice Easter dinner. And now, I’m here. Writing this blog. It really is amazing to see how much can change in one year. Last year, I felt completely isolated and alone. This year, I was surrounded by friends, family, and love. And fittingly enough, I’m listening to one of my favorite songs from one of my favorite musicals – Seasons of Love from Rent – as I write this. “How do you measure a year? In daylights, in sunsets, in midnights, in cups of coffee, in inches, in miles, in laughter, in strife, in five hundred twenty five thousand six hundred minutes. And friends, that is the difference. Last year, last Easter, was 365 days ago. I lived in a different apartment. I had different friends. I was taking different classes. I had, for all intents and purposes, a completely different life. What changed was my mindset. My perspective. This Easter, I am choosing to live in love. Last Easter, after I wrote my semi-emo forever-lonely blog post, I received an outpouring of love and support from all of those around me. I just didn’t see it. A friend sent me a care package, two friends called me immediately after I posted the blog just to check in, people asked me about it the next day…it was just great, but I didn’t see it in the same way. This year, I’m in a place where I can not only feel the love around me, but I can share it. I can give love to others to acknowledge my own appreciation. But, admittedly, that is hard to do when you aren’t in that place. So for all who are reading, here are some reminders. Love yourself. Love others. In that order. Last year, I was not in a place to share love. My well was empty, and it needed some serious refilling. I needed to focus on myself first, so then I could learn to see and appreciate all the love that was surrounding me. Last year, I was only able to see what was right in front of me. Looking outside that perimeter, there is so much more. Most of the friends that I have (still) are not in the same city as me. And the friends that I do have here this year are only friends because we are able to have a deep and genuine connection. Everyone else can step. But family is still family, even if they are five hours away. Taking off the blinders can help you see all the surrounding love that might not be in your physical area. Just because I’m in a better place this Easter doesn’t mean that last year was a picnic. Being open-hearted means being vulnerable, and even to this day, that is one of the hardest things for me to be. It’s scary. But through love, it is possible. So with that, I am spreading all the Easter love this year to all of you today and every day! This week, I was serving on an alternative spring break trip in Selma, Alabama. I know, it may seem random. But there is actually an extreme amount of history in Selma, especially in relation to the Civil Rights Movement. On this trip, I met some of the best people in my entire life. The group of students I was with, my co-advisor, the people and students in Selma…literally every. single. person. Y’all are just incredible people. Usually, I process through writing. I’m the guy that’ll say, “Okay, I’ll be over here in the corner,” while I pull out my journal or laptop to sit and process my thoughts for the day. But on this trip, I didn’t do that once. In lieu of that, our group had four hour debriefing conversations that went until two in the morning. And I loved every minute of it. But because of that, I’ve been having a difficult time putting my thoughts into written words. But, Sunday means a new blog post, so here we go. This week, I have learned so much about myself. I have grown more than I have this week than in entire years of my life. I was given a new perspective. I began to release my own freedom from within. I connected with like-minded individuals. But most importantly, I found a home. I found a community of people who felt mutually supported, cared for, and loved. And although it is so incredibly difficult to condense all my lessons from this week into one post, I’m going to try my best. Because even the smallest snippet of what I learned might be useful for all of us here, no matter your age. We all have walls built up around us. From previous experiences, people we’ve met, etc. But in Selma, I felt as if all of our walls were gone. There was no reason to have walls in such a loving, caring community. And by the end of the week, with walls gone, we were all able to say that we loved each other, and we all genuinely meant it. In many social justice trainings, we talk about eliminating stereotypes of other people. But what about the stereotypes that have been placed on us by society? This is a silly example, but this week, I learned that I love to dance. But before, I was always so reserved about it. Maybe it’s because I was trying to be “a professional” or maybe I was “too uptight” to let loose and have a good time through dance. But we have the power to free ourselves of those stereotypes. Liberate yourself from society’s expectations. Some of you may know, I tend to get frustrated with some folks who believe certain things. I get especially frustrated with people when I think that their eyes will never open, because I feel like there’s nothing I can do to help them see the truth in this world. But here’s the thing: you never know when you are planting a seed. You might say something that doesn’t make sense to them in the moment, but days, months, or even years later, they might call you in tears in a moment of finally understanding what you were trying to say. Or maybe they won’t. Either way, you never know when you are planting those seeds. A man I met this week said, “I love Donald Trump. I don’t love his ideas, but I love Donald Trump.” I was confused. I thought Donald Trump’s ideas were Donald Trump. But that’s not necessarily the case. Trump comes from an environment that leads him to believe what he does. Principle three of nonviolence states, “Attack forces of evil, not persons doing evil.” In other words, hate the sin, not the sinner. We are all deserving of love, and because of that, we have the ability to love all. Everything I’m saying here is terrifying. It’s not easy. As written in Hamilton, “Dying is easy, young man; living is harder.” Living is harder. It takes courage. The first principle of nonviolence, “Nonviolence is the way of life for courageous people.” This blog post is not a check, check off my list. It’s a process that I will be working on for a long time. But finding that courage and inner strength will help in that process. And although there is a sense of heaviness with me today while I process leaving a place I grew to love so much, I am high-key excited to begin this journey, and learn to live out these lessons. For those that don’t know, this past week I was gallivanting around Chicago for a conference and loving every minute of it. The conference, Creating Change, was absolutely amazing. It focused on LGBTQ advocacy and social justice, and I learned so much. Among other tales from this past week, I saw the Bean, tried authentic deep dish pizza, fell in love for the weekend, and suffered a major bout of food poisoning. And as much as I would like to go on and on about any or all of those stories, that isn’t necessarily the point of this blog. We can’t let our need to learn keep us from action. This resonated with me in all types of ways. Mostly because, as a 24-year-old graduate student, I sometimes still doubt my knowledge and my ability to create change. I went into this conference thinking I had a whole lot to learn. I’m still in the beginning stages of advocacy work, social justice movements, and really understanding the bigger picture. But, I was surprised to walk into that conference and be able to share some knowledge that maybe other people didn’t necessarily have. We are all learning. We are life-long learners. At least, I hope we are. Regardless of whether or not we are in school, whatever level of formal education you have, there is always something to be learned in the world. This past week, I learned multiple things about LGBTQ advocacy, social justice issues, etc. So I’m here to report back. Now, granted, I know that not all of us work in Diversity Centers or in Higher Education, so I’m mindful of that, but these are some lessons that I learned or was reminded of during my time in Chicago. I was PUMPED to go to Chicago! New foods, new people, and an amazing conference that I heard nothing but good things about. Take risks and embrace the adventures in your life – from the every day adventures in the coffee line to traveling to new cities. “Eat whatever you want!” they say. “It’ll be good!” they say. Yes, until you are hugging the toilet bowl at 3am, 5am, and 6am after eating something that was clearly poisoned. Now, here’s the thing. What was the alternative? I couldn’t not eat. The new lesson here? Every action has an equal and opposite reaction, whether or not you know what that reaction will be. Oftentimes, the reaction is hard to predict. Never in my life did I expect to meet anyone of substance at this conference. Hooking up, sure, maybe. Professional connections, definitely. But someone who can hold a conversation and is super cute and is nice to spend time with? Well, I didn’t expect that. And I feel like it’s only when you don’t expect it, that it happens. If people want to talk about diversity programming with university students, I’m your guy. Student development theory? Hit me up. But I also have so much to learn. At this conference, it was evident that while everyone had their own special and unique interest areas, we were all able to learn and grow from each other. I was sitting in the airport, sleep-deprived, drained of all fluids, thinking of nothing but work and school starting back up tomorrow. But as soon as I saw my friend pulling up at the airport to pick me up, I knew that I was back home, and that was a good feeling. It was so good to see her, and I know it’ll be great to see work friends tomorrow, and to be in the classroom again. By viewing it as a positive, it’s making me feel less sad about leaving Chicago, and happier to be back in Buffalo. But for this week, I have one final thought on 2016. At least, for right now. As the new year is well underway, I’ve been surprised by the number of times this year I’ve been visited by ghosts of my past. Skeletons in the closet, if you will. And most of these skeletons, surprisingly, have been from relationship-type situations. The worst. This week alone I responded to a four-month-old Facebook message from an ex, was laughed at by someone when I told him I only wanted to be friends, and gave out my number to this cute guy at Starbucks. Well, damn. That is a lot to happen in one week! Especially for me, someone who is chronically single, someone who uses the answer “nonexistent” when someone asks me about my love life. And yet, from these three experiences this week, I’ve learned something from each one. They’ve all signified something important about my relationships…the past, the present, and the future. This is my favorite ghost. The Ghost of Twentysomething Past is the ghost that I have learned the most from. It’s also the ghost that can be the most painful, which is hard. And surprise, it never goes away. Ghosts of your past will always be a part of your life tapestry, no matter how many times you wash, rinse, and repeat. It’s up to you how you view it: a tarnished stain, or a beautiful new set of stitches. It reminds you of who you are and why you are here today. Maybe you aren’t with that person anymore, or you didn’t end on the best of terms, but there’s a reason for that. Looking in the past, it gives you the opportunity to reflect, learn, and grow. Hindsight really can be 20/20. I find this ghost to be the most unexpected (yes, even more unexpected than the future). Here’s why: sometimes, the future is so far away that it’s not even worth making plans. The typical case of this is saying something like “I really want to wear a white bow tie on my wedding day!” when you’re still single AF. It’s hard to plan for the future if your present isn’t lined up first. So you go on a few dates, think it’s going really well, and then BAM. You meet someone else, something comes up, it’s not a good time. Whatever the reason. Which is why, in the Ghost of Twentysomething Present, it’s important to be as adaptable as possible. Things will always be happening. In the present, anything could happen at any moment, the script is still being written. Whereas the past is archived and the future is still blank. Life is a constant state of change, and you won’t feel it more than in any other moment but the present. The ghost of excitement. New beginnings. Also, the ghost of anxiety, nervousness. Uncharted territory. The Ghost of Twentysomething Future leads to thirtysomethings, fortysomethings, and beyond. It leads to milestones. There are a whole bunch of stories from older thirtysomethings and fortysomethings saying that if they could give one piece of advice to current twentysomethings, it would be to prepare more for the future. That’s all fine and dandy, and I don’t necessarily disagree. But I also think it’s important to keep an open mind and not try to plan detail by detail. Be ready to embrace your future with open arms. What’s most important in all of this, though, is that the past, present, and future are all a part of who we are, and help to tell our own individual story. It’s what makes us unique. It’s what makes us who we are. And for that, it is beautiful. Well hello everyone, and Happy New Year to you all! Last week, I wrote a blog post about preparing for the new year. With all the hype, I didn’t have much of a chance to reflect on this past year, especially in regards to my blog. Luckily, WordPress created an annual report for me! Looking back at my blog this year, I wrote 49 blog posts (one for every week since I started blogging) with more than 5,000 views in 27 different countries. For a guy who just decided one day to start writing a random blog about the twentysomething experience, THIS IS SO COOL! So, what better way to reflect back on this past year of blogging than with a recap of my top favorite posts? Reading back, these were the top 25 lessons I learned and wrote about in 2015. Do something you love, regardless of what anyone else says. Home is not a concrete term. It doesn’t signify a building or a town, and it’s possible that the idea of “home” will change over time. You are a person, outside of work. So much can change in one year. Life is a roller coaster. What goes up, must come down. And just when you think the ride is over, that’s when you need to hang on the tightest. Treat Yo Self! (special cred. to Parks & Rec). Your future self will thank your twentysomething self if you work out, eat healthy, and take care of your body. It’s unlikely to know everything about yourself. The important thing is to be aware and reflect on who you are. You can always change your mind…in everything. Career, friends, Friday night plans. It’s okay to change your mind. You can only “grin and bear it” for so long. Splitting yourself into multiple identities and personalities won’t do anyone any good, especially yourself. Instead, work on congruence: blending all of your selves into one. Ride the wave. If you try and fight it…you’re going to get pushed down. Money is important, but so are fun times with friends. Move forward, but don’t forget to look back. Find a mentor (or multiple mentors). There is no “right” way into adulthood. Your passions are the things that keep you awake at night. Follow these things. Break the awkward twentysomething silence. Believe me, no matter how absurd or embarrassing, you are not alone. We live, we learn, and we grow. And with that, from one twentysomething to another, I hope you’ve all had a wonderful start to the new year. With these lessons in mind, I promise there will be plenty more twentysomething posts to come! As all of you MUST know by now, Adele released her newest single, “Hello,” this past week. If you don’t know what I’m talking about, please click here immediately before continuing to read this post. All for valid reasons, and I 100% agree. But I’ve also heard some push back that I need to address. 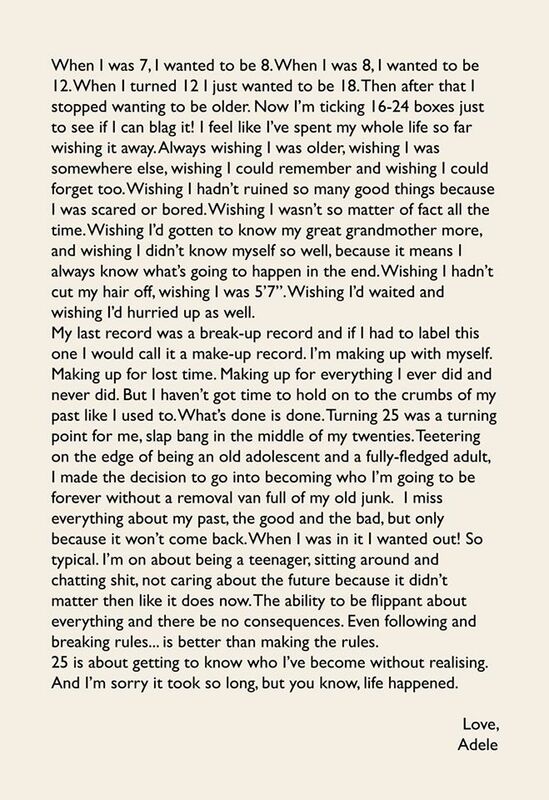 “It sounds selfish, Adele making this album for herself.” I’m sorry, what? Adele has said this: “My last record was a break-up record and if I had to label this one I would call it a make-up record. I’m making up with myself.” Well, damn. Isn’t this the pinnacle point of all relationships? Break-up, make-up, repeat. The catch here, which I absolutely love, is that it’s Adele making up with herself. And the whole entire reason I’m writing about this is because of that idea. Yeah, sure, I love the song and it’s been on repeat nonstop all week. But for me, it has a deeper meaning. This isn’t a break-up song. It’s a make-up song. And speaking unitedly as a group of twentysomethings (and people of all ages, really), I’m going to generalize and say that we all need to embrace this concept. Make up with yourself. The past is the past. What’s done is done. I’m more concerned about looking ahead. Living in the present, yet still being able to move forward. And how can we do that? Make up with the past, and make up with yourself. Who are you? This is a real question, not rhetorical. Take out a piece of paper and a pen, and write down five of your most salient identities. For example, I am a son, a brother, a writer, a student affairs professional, and a graduate student. Reflecting on your identity is such an important concept in getting to the other side and in moving forward. Who are you? Who do you want to be? Are those two visions aligning? In order to get to the other side, you need to be able to say, “Hello, it’s me,” in a clear, confident tone. Know who you are, who you want to be, and where you are going. Listen to yourself. Can you hear yourself when your intuition is telling you something? I have found this to be especially true in coming to term with your values, especially if you find your own personal values to be changing in ways that you would’ve never thought of before. Just listen to yourself. What feels right for you? Getting to the other side requires a certain amount of self-awareness, and in order to get there, you just need to listen. Self-care. How are you doing? How are you feeling? This one is so so important. After you discover that new sense of self-awareness, think about how you are going to maintain it. If you know that you need to have a challenging conversation, have it. But make sure that you are doing everything you can to take care of yourself first and foremost. Some see it as selfish, I see it as wise. One last thing: this is a process, people. Getting to the other side is not as easy as One, Two, Three. I think you can hear the pain in Adele’s voice with this new song. AKA, it’s not going to feel easy, but it’s going to feel right. Finding a mentor is one of the most important things in life. I know that sounds like a dramatic statement, an exaggeration perhaps…but I dare you to challenge it. Mentors are kind of like the idea, “You don’t know what you have until it’s gone.” Except with mentors, it’s the opposite. You don’t know how valuable mentors are until you need one. A mentor is someone who can guide you through those not-so-great experiences. Someone who is there to validate what you are going through and help you work through it. I used to think that a mentor was someone who provided guidance for all aspects of life, but as I’m getting older, I’m realizing that’s not necessarily the case. When I am feeling musically inclined, I email my piano teacher for Chopin suggestions. A musical mentor. When I am feeling stuck in a writer’s block, I email my writing coach. A writing mentor. And when I am feeling discouraged at work, I can walk into my supervisor’s office and ask her advice. A work mentor. A mentor is someone who has most likely gone through your experience and is able to offer helpful advice. Someone who has been there before. But because we all have so many different experiences, it’s hard to have one “life mentor.” But it’s easier to connect with people who have similar interests and similar experiences. When going through any kind of difficult twentysomething period, I’ve realized that I can’t really rely on my musical mentor, my writing mentor, or even my work mentor. It’s nice to hear about their perspective, but it’s even nicer to hear from other twentysomethings who are going through similar experiences in the same time period. This may sound strange. Usually, when looking for a mentor, you want an older, wiser person who is able to give you their words of wisdom. But sometimes, especially as a twentysomething, I just need another twentysomething person to tell me that they’ve also had drunken encounters before and regretted it the morning after. Or that paying rent nearly cleared out their bank account. Or that grad school is completely soul-sucking. You need to be able to relate to your twentysomething mentor, and even more importantly, they need to be able to relate to you. If there’s one overarching theme that I’ve learned about being a twentysomething, it’s that vulnerability is a consistent feeling across all twentysomething experiences. The security of college is gone, the security of living at home or with friends is taken…hell, you may not even have a secure job, relationship, friend group, etc. There is no stability at all. Hence, vulnerability. If you go about your whole mentor/mentee relationship skirting real-life adult issues, nothing is going to get any better. Take a risk and be vulnerable. If you feel you have no friends, it’s okay to say that. If you hate your job, be honest! Be honest, take risks, and embrace the vulnerability. You can’t have a mentor and not be open to at least hearing what they have to say. They might tell you that you need to get your life together, that you are having way too many one night stands, or that the number of Chinese take-out containers in your apartment is getting out of control. Take it in stride. Maybe your life is a mess, maybe you really enjoy meeting new people in that way, and maybe you just love Chinese food. It’s cool. Or maybe there is some truth in their advice. Either way, take everything with a grain of salt, but still be open to listening. And when all is said and done, make sure to thank you mentor, because without them, who knows where you’d be?